Turquoise Gold Jewelry is one of the oldest forms of jewelry on earth. The early Egyptians and other ancient cultures made a large share of their jewelry from Turquoise and Gold. Turquoise was one of the first stones known to man kind and used in personal adornment. Examples of this Vintage Turquoise Jewelry can be seen in the Cairo Museum, Smithsonian Museum and other wonderful museums and national parks around the world. Of coarse these ancients made silver and turquoise jewelry, but in those times it was mainly people in power, the elite that wore jewelry and they loved gold. Turquoise Gold Jewelry is beautiful and unusual. In general Turquoise has been associated with Sterling Silver in the United States in the past with little set in Gold, however, Turquoise set in Gold is and has been standard in most other places on earth. Durango Silver Company has been making Turquoise Gold Jewelry since the 1970's. We even use natural Colorado Gold Nuggets in some of our Turquoise Gold Jewelry. As of late we have been selling more and more gold jewelry along with our silver jewelry. With the decline of the USA dollar in worldwide trading demand for gold and silver is way up and if you are going to invest, why not invest in something you can wear and enjoy instead of something you hide away in your vault or bank. 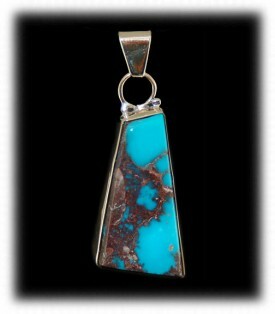 The handmade 14k gold and natural Bisbee Turquoise Pendant to the left displays beauty in simplicity. The rare American Turquoise has been cut in a modern shape and set in a simplistic and current style, which will never go out of style. When most craftsmen or handmade jewelers make Turquoise Gold Jewelry they use their very best Turquoise cabochons or inlay their best stones. This is not always true with mass produced or "Price Point" jewelry, which is 95% of the jewelry made today and available on the open market from companys such as Overstock.com, Zales, Jared's and the like. We feel if you are going to invest in Gold and Turquoise Jewelry, why not buy the best and make it an heirloom. To the right is a wonderful "Lost Wax" style 14k gold ring by John Hartman of Durango Silver Company. This men's gold ring features the very best Turquoise money can buy. As you can see the NATURAL Persian Turquoise cabochon features the brightest blue with red spiderweb matrix. The design of this Turquoise Gold Ring is very unique. Above to the left is one of the finest pieces of Turquoise Gold Jewelry we have ever made here at Durango Silver Company. 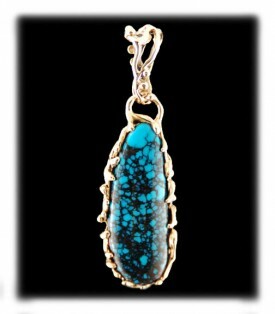 This Gold and Turquoise Pendant features a huge natural cabochon of Blue Wind Turquoise. This ultra rare American Turquoise cabochon is top gem grade and came from a small hat mine in Lander County, Nevada USA. The Blue Wind Turquoise Cabochon features beautiful black spiderweb matrix. Turquoise of this calibur is very hard to obtain and always has been..This is a great example of high end 14k yellow gold and Turquoise. To the right is a classic style 14k gold and golden yellow spider web Turquoise from the Turquoise Mountain Turquoise mine in Kingman, Arizona. 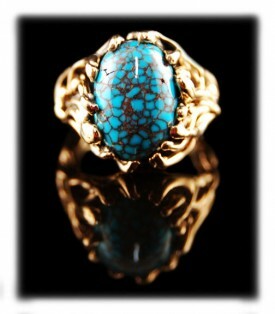 The focal point of this gorgeous Gold Turquoise Ring is top gem grade cabochon of natural Turquoise Mountain Turquoise. 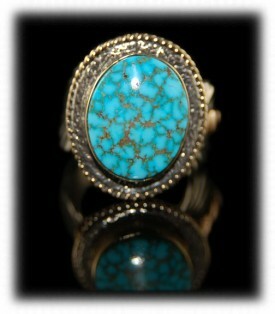 The design of this women's Turquoise ring is timeless. To the left is a "lost wax" style 14k gold and Carico Lake Turquoise pendant by Nattarika Hartman. 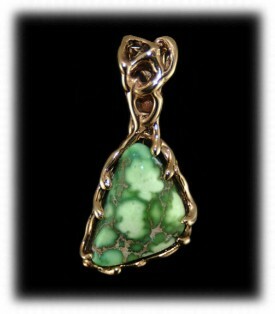 The Lime Turquoise cabochon used in this spectacular yellow gold pendant is extremely rare and hard to find. Nattarika did a beautiful job mimicing plant vines in the design of the gold. This type of design is unusual in gold jewelry and especially with Turquoise. Above to the right is an inlay Turquoise and gold pendant by Marian Paker of Reno, Nevada. 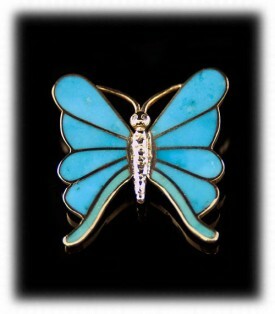 This 14k yellow gold, Diamond and Blue Gem Turquoise is one of a kind and features exquisite hand cut inlaid gemstones. The craftsmenship of this gold and Turquoise pin or broach is second to none and really show cases the quality handmade jewelers expect in their finished product. If you would like to see more quality Turquoise Gold Jewelry, Gold and Turquoise and other designs as they become available. We invite you to join our other members in joining our occaisional Newsletter. Occaisionally, we send out a Newsletter with news about Durango Silver Company, Southwestern Jewelry produced by our company and the latest news from Durango. We also have a monthly drawing and give away a piece of Jewelry from Durango Silver Co to one of our friends that have subscribed to our Newsletter. Thank you for reading about Turquoise Gold Jewelry, we hope this brief page has been helpful and has openned up your eyes to a different type of Turquoise Jewelry.